Archsenex had the most liked content! I generally find Satisfactory to be a great example of EA done right. They've still got a lot of content they want to add in, but the content that they have in is Well done, tested, and polished. I've been through several EA's where the focus was on showcasing everybody the best example of a small part of the finished product, so that a player can easily say to themselves "I want more of exactly this". There's also a big difference that many of those games go through proper Alpha tests, and sometimes even Beta tests, before EA. As others in the thread have stated, where the EA point is can change drastically from game to game. The best are those where it's truly EA, after a proper Alpha test, and not using EA as a replacement for a Proper QA team and internal testing. Even that would be something. But so far they won't even come out so far as to say that they don't intend to have another, or that this one wasn't intended. Will these monthly major releases ALSO be coming with Monthly wipes? Want to know what cadence will be on those. You've been rather dismissive on specifying what the wipe schedule is despite many, many people wanting concrete answers on how frequently they will be. I've participated in probably about 40 early access launches. So far, this is the first one that did not explicitly state there would be progression wipes in their terms. That's my only complaint, if they'd said it in the terms it would be a very different story. Not all EA games wipe. That's why those that do put it in their terms. Do gotta wonder why they bother with a number at all though. Wasnt it originally going to be 14? (Poll) WHO WANTS AN ISLAND? They don't actually have to make all the grids the same size. They could make the instances much smaller than a full grid. Part of the way the system handles load is the stasis system. Already, if nobody is near a part of an island, it goes into stasis. Stuff that isn't in use uses almost no resources, and they could completely spool down the private grid for offline players. Ultimately, the purpose of the proposal is to just consider it as an option. I do agree, no plan will make everybody happy. After all, there were people in the first round that got to claims first, and had unlimited forever invincible control of multiple islands at a very high tax rate. Many of them probably are not happy. Ultimately, it's about coming up with what's best, or at least what's least worst. There may need to be sacrifices from the pure design to just make the game work. I don't think players will concentrate as much as you think either. Very quickly, getting just plain generic materials will start to burn anybody who wants to progress. If you want to do anything OTHER than just building, you'd have to come out of your hole. The private home zones would quickly become mostly for people who JUST want to build, or to be a refuge and storage point that players could use. There's actually other reasons why, from a processor standpoint, it's a good idea. Ships and Tames that are parked in your private instance will go into stasis much more readily than those that are parked around other islands. Our primary bases were on Lawless islands, but most of their purpose was just to hold a bunch of tames. the server had to pull them out of stasis and process them every time ANYBODY walked by our base, and for a short period after. The way the game is architectured, with Stasis and that each map is really only processing when there's a player nearby, means that in terms of resources, private instances that are small, say the size of current freeports, isn't a huge system resource argument. They have to solve the pillar spam problem pretty much regardless. Even one claim flag per person doesn't stop a group from using their claim flags to plug up the rest of an island. And what's to stop a person from putting their claim on resources and just building on it without it being spam. Same with needing to expand, unless you get way more space than you need, you'll run into that issue regardless if other people choose to set up next to you. Shared spaces for things like shops work better in a non free style setup, such as if free ports have 50 shops and you have to rent one. There are just a lot of problems with the inherent goal of wanting people to have personal....shared space. This proposal is to at least try and give you a slice to work with and not force you out while you're getting started etc. I think theres some assumptions about the instancing. It would be more like instanced freeports than instancing every island. You'd still have shared claim space etc where people would build their communal structures etc. You just wouldn't be forced to compete for a claim to get any land at all. Yup. 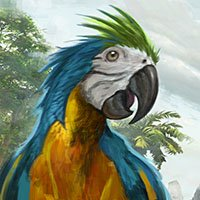 Youd want to have the islands drop generic resources. They'd mostly be a home and for people who want to "just build" as many have stated. You could even level clamp them to encourage leaving but not force it. It solves a LOT of problems though. A personal island makes almost every complaint about the flag system no longer really an issue. At that point, either new system is probably fine.